It’s almost Thanksgiving… you know what that means?! It means the occurrence of the equally important tradition known among many friend clans as Friendsgiving. For several years now, my group of close friends have made it a point to feast together before everyone departs to home for the holidays. We all imbibe on some red wine and eat to our hearts content in comfy (and definitely stretchy) pants, undoubtedly reminiscing on a funny story from years past and being grateful for one another in our own ways. Each clan member is responsible for bringing a delicious Thanksgiving-esq dish for this gluttony marathon, and the gracious host is always responsible for dealing with the bird. I was late to the email chain laying claim to side dishes, but after devouring Food and Wine Magazine’s Thanksgiving issue, I knew I didn’t have a problem. Enter: Friendsgiving Appetizers! I took a few liberties with the recipe to give it more of my own flare, but the basics are the same. In a large bowl, massage one of the kale heads with apple cider vinegar and 2 tablespoons of olive oil and let sit at room temperature for 30 minutes. This makes the kale more tender and extra-sweet. In a baking pan, tear apart the second kale head into large pieces and toss light with some olive oil. Bake kale for 20-25 minutes or until crispy. Meanwhile, in a medium bowl, combine 1/4 cup lemon juice, 1 tablespoon lemon zest, soy sauce, agave nectar, and a 1/4 cup olive oil. This was a bit sweet for my taste, so I added a tablespoon on red wine vinegar. Whisk together and set aside. Use a peeler to strip the carrots into thin ribbons. Add carrots, chopped apple, scallions and Parmesan cheese to the kale salad in the large bowl, and mix in crispy kale when ready. Toss entire mixture with vinaigrette for a super healthy, vibrant Turkey day salad! This is one of several appetizer dips featured in the magazine, and it turned out to be a marvelous idea. Think about how much time your loved ones sit around waiting for the gravy to finish or someone to arrive with the mashed potatoes. This dip is the perfect solution! 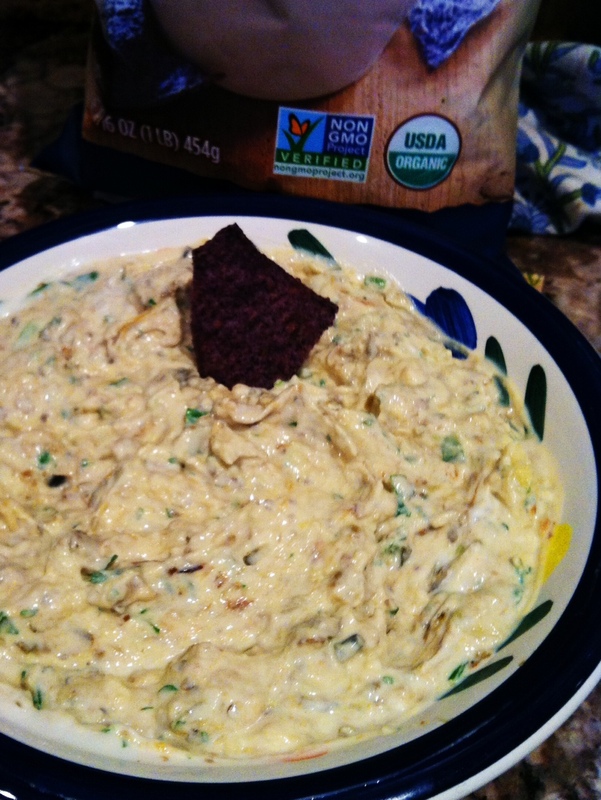 Pair with blue tortilla chips or pita chips. Slice the eggplant vertically into 1 inch pieces. Lay flat on baking sheet and drizzle with olive oil. Broil in the oven for 5 minutes, or until slightly charred and softened. Turn the oven down to 375 degrees. Add chopped garlic cloves and scallions to the eggplant, and bake for an additional 35 minutes. Make sure eggplant is super soft before removing from oven, and allow to cool completely. Scrape the “meat” out of the skins and put in a colander for 15 minutes, or until totally drained. Mince eggplant, scallions, and garlic; transfer to a bowl and add in the Greek yogurt, lemon juice, and herbs. Mix thoroughly together, and serve at room temperature with some dipping chips. Did any of you participate in a Friendsgiving?? I know my mom and the rest of their lady group will be dining together this evening, so I thought I would try a recipe that I know she would love even though I can’t be there to make it for all of them. 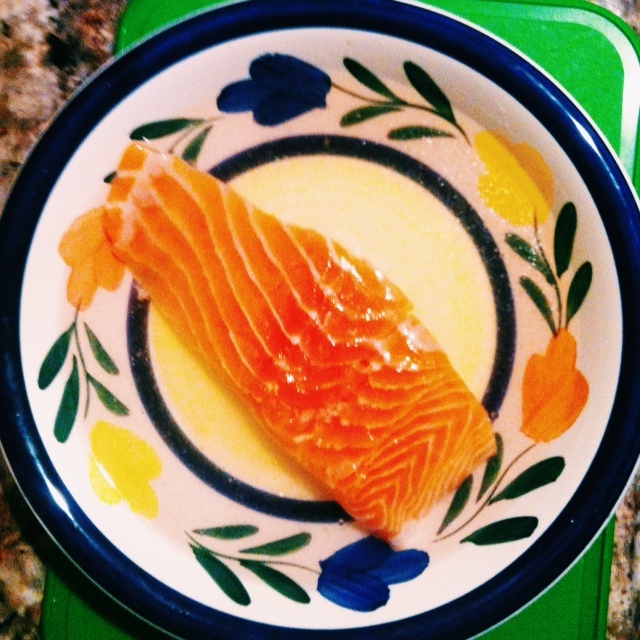 If you’ve been following this blog at all, you know I’m an avid salmon eater, and so is Patricia! 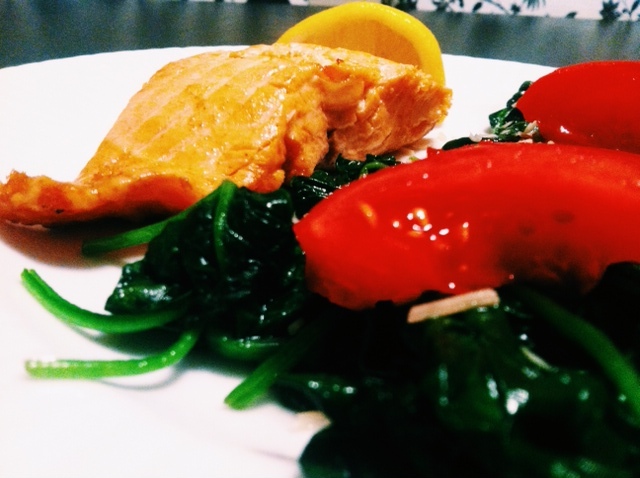 In the past I have always cooked salmon on the grill or in the oven, but I saw a recipe in Women’s Health Magazine that peaked my interest: poached salmon in olive oil. And let me tell you, it is definitely worthy of a birthday dinner. Quick, healthy, affordable, and with an air of fancy. 6 oz. 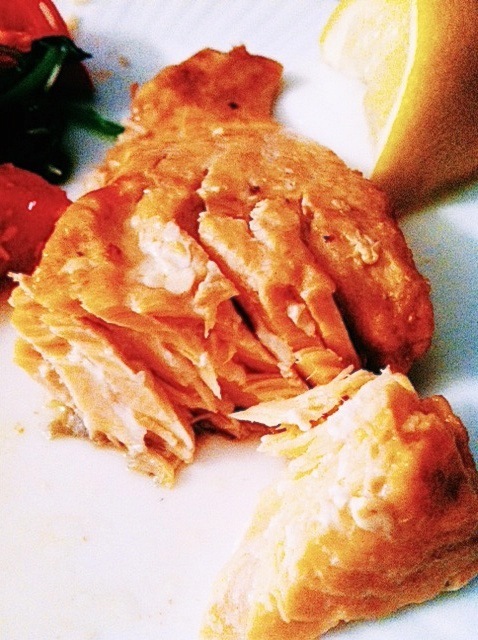 salmon fillet (per person). 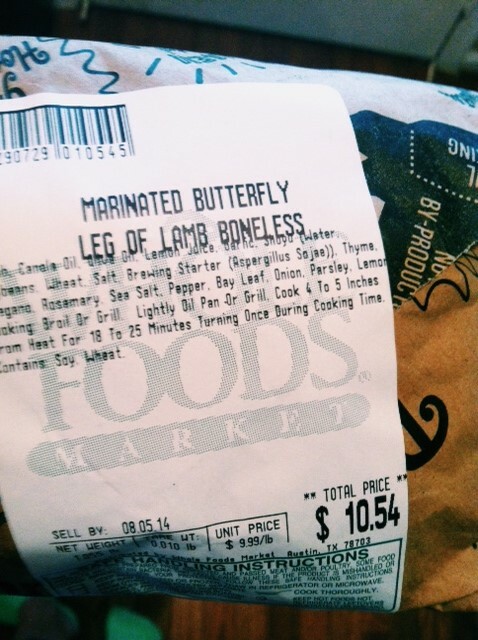 I got mine for $6 at Whole Foods because yes, we are nomming on a budget. Bottle of extra-virgin olive oil. The cheapest you can get is probably $8 but the rich flavor is worth it. In a large bowl, whisk together a cup of water and 1/8 cup salt per fillet. Add fillet and soak for 4 minutes. Remove and pat dry. In a large skillet, squeeze half a lemon’s worth of juice. Mince and add garlic clove (you can add as much garlic as you are prone to enjoying; for me that means a whole clove). 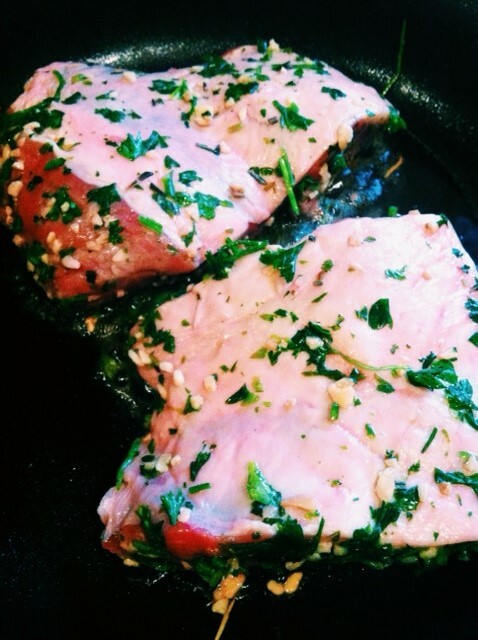 Fill the skillet with enough olive oil to cover the fillet. 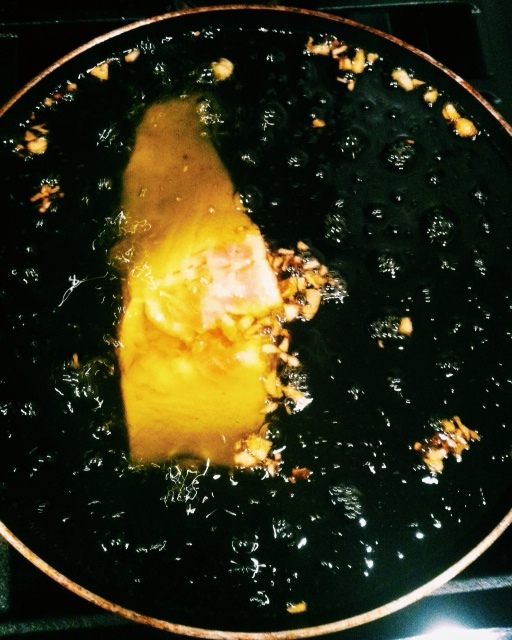 Try and use good-quality oil for the poaching, as the fish will pick up some of it’s flavor. Heat on medium until a food thermometer reads about 125 degrees. I do not possess such an instrument, so I kept the oil at a robust simmer and didn’t let it get close to boiling (which is 212 degrees). Add the fillet and cook until internal temperature reaches 115 to 145 degrees. I maintained the aggressive simmer, and did so for 12 minutes exactly. Remove fillet to a wire rack to drain for a few minutes. I again do not have this kitchen accessory, so I simply kept the fish on a perforated spatula over a plate so the oil could drip down (#cookinghacks). 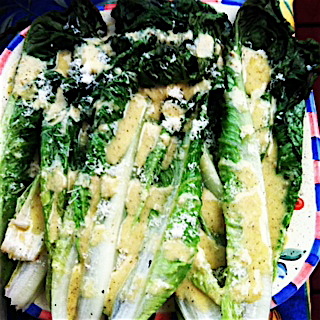 Serve with a lemon wedge and some greens (or any side of your choosing!). I went with sauteed spinach and tomatoes, sprinkled with Parmesan cheese. Look at the pretty golden skin! Apparently this is because the “deep poach”, unlike frying, does not allow the liquid to get near boiling. Frankly, I was nervous to cut the fish open and see if it had actually cooked. But look! Proof that it is a perfectly medium-rare and flaky fish. Patricia, I hope you enjoy your day and get to celebrate with lots of laughter and love! 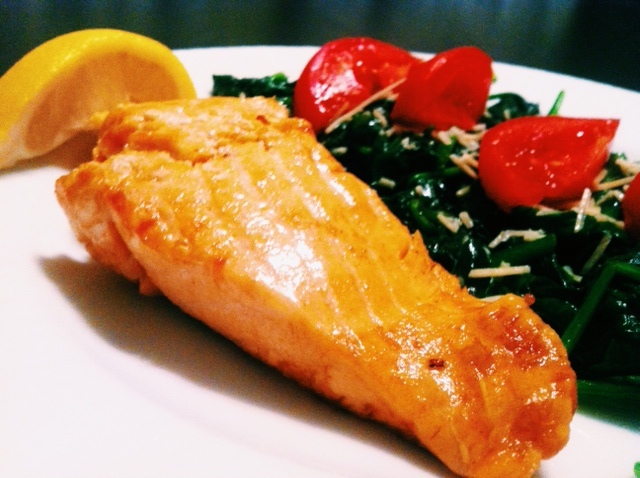 Feel free to try this new salmon recipe, and let me know how you like it! So as I noted in my previous post, August is birthday month!! I turn the ominous 25, and my roommate bestie turns the mature 26. To ease the potentially anxiety-ridden stage of my quarterlife crisis, I have decided that August is going to be treat yo’self month. I am going to be good to myself, mind, body, and soul. Plus I want to look kickass in my birthday outfit, obviously. 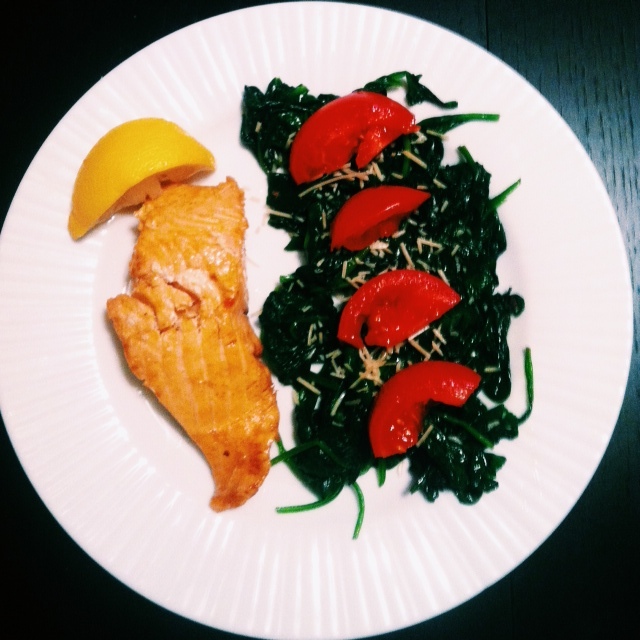 As a kickoff, I made a delicious carb-free dinner chalk full of protein and veggies. The marinated lamb is a give-in favorite of mine, and I tricked my body into thinking it was consuming creamy mashed potatoes when in fact it was crazy-good mashed cauliflower! Tehe I’m so sneaky. TWO for $10. Definitely beats the $28 that a restaurant would charge for an equally delectable lamb dish. Buy the pre-marinated version to save yourself some time and money. Throw into a pan that’s on high heat, coated with cooking spray and some melted butter. The butter will sear the lamb, sealing all the flavor into the meat. Normally I would grill these, but alas, we have run out of propane. Be careful when you’re cooking in the pan, as the lamb can go from bloody to medium in a matter of minutes if left unsupervised. It’s also super steamy so turn on your microwave fan or open a window. 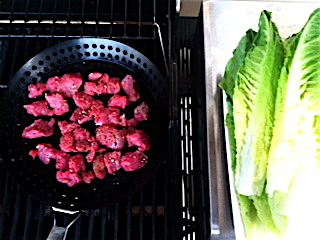 Cook about five minutes on each side, and cut open to gauge the temperature. Reduce heat if necessary. If the meat is right on the brink of your desired done-ness, remove from heat immediately and cover with a lid, as the lamb will continue to cook internally for a few minutes. Another option is to pan sear for a few minutes on each side, and then bake in the oven for the remainder. Remember that while this is going on, you need to put your cauliflower into a food processor with the rest of the ingredients. I would do this while the lamb’s first side is cooking. Pile in the cauliflower with two garlic cloves (chopped), a heaping spoonful of the cream cheese, two tablespoons of Parmesan cheese, a tablespoon of olive oil, and your green onions/chives if you decided to go that route. Blend until smooth, tasting along the way and adding more of any ingredient. Hint: more cream cheese makes them more creamy! Try not to let this process interfere with monitoring the lamb. When lamb is done, scoop the mashed cauliflower onto your plate and sprinkle additional Parmesan cheese and some oregano for added flavah. Done! And if you didn’t share, you’ll have plenty of leftovers. 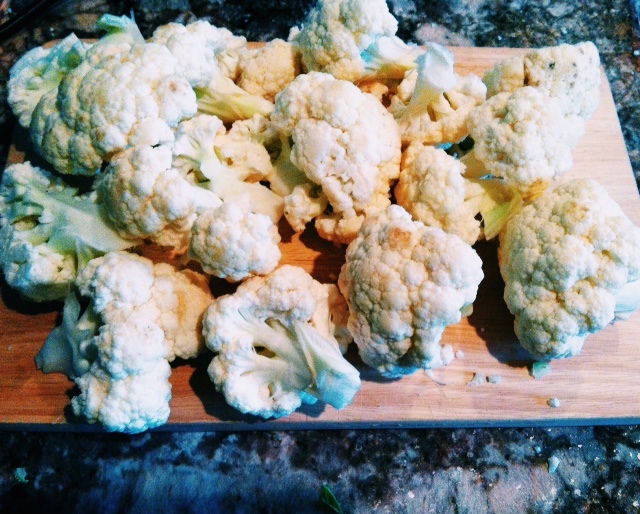 The mashed cauliflower keeps surprisingly well for a day or two. Enjoy! Happy last day of September! With the looming federal government shutdown right around the corner, literally, I thought a frugal Nommin’ on a $Budget post was particularly appropriate. Last week I discovered something quite exciting- Target sells 6-packs of chicken for $9.99. Needless to say, I’ve been combing through my plethora of chicken recipes to make an exciting bulk dish to last me through this depressing week. 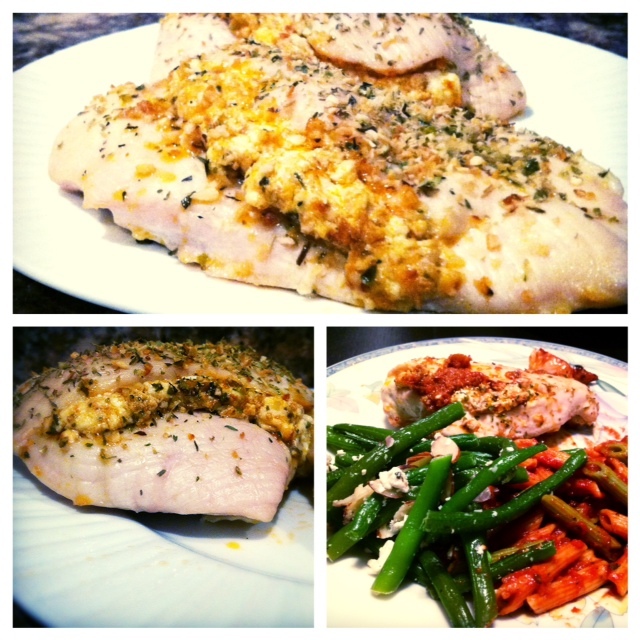 I settled on what you see pictured above, chicken breasts stuffed with goat cheese and sun-dried tomato. Each individual breast is PACKED with flavor and they last nicely for a few days in the fridge. The recipe only calls for a few ingredients, and after making this several times for hungry roommates and tweaking where necessary, I think I’ve got it down pat. Preheat oven to 350 degrees. Cut a slit down the side of each chicken breast. This part is probably the hardest- you want to create a pocket big enough to fill with the goat cheese mix, but do NOT want to break through the chicken. I usually do a shallow slit down the side, more towards the top of the chicken breast, and then wiggle the knife around the middle to make the pocket. Sprinkle garlic and oregano on both sides of the chicken and set aside. In a separate bowl, combine the goat cheese, Italian herbs, and sun dried tomatoes- mix well. Then, fill each chicken breast with a generous spoonful of the mixture. You want to make sure that it all goes in that pocket, and there’s room for the mix to ooze out while baking and not create a hot mess. Spread the stuffed chicken out evenly on a baking sheet and bake for approximately 12-15 minutes, checking periodically. Anddd you’re done! Garnish the chicken with any extra sun-dried tomatoes before serving (perhaps with some string beans tossed with almonds and feta, pictured) and you have an affordable, healthy, and nommable meal for days!